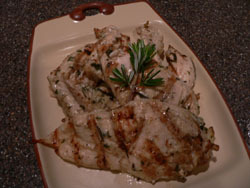 The hint of rosemary in the marinade for Grilled Chicken Breast is perfect. Serve this with brown long grain rice and steamed broccoli for a wonderful calorie conscious dinner. Pull the rosemary leaves off the twig and chop up a bit. In medium bowl combine all ingredients except the chicken and whisk thoroughly. Poke 3 chicken breasts with a folk and place into a zipper bag, pour marinade over the chicken, close bag and keep in refrigerator for minimum of an hour for flavors to blend and chicken to pick up the flavors. I like to do this the night before cooking so it has plenty of time to marinade. The longer the better. Preheat grill to 375°. Place chicken directly over heat. Chicken breast cook fairly fast so keep an eye on them, turning now and then to move around the heat as breast are irregular in shape. Whole breast usually will cook in a total of 10-15 minutes. I like to cut the breast in half so they cook in even less time.